Environmental Health Sciences faculty expertise extends across a variety of disciplines, including development of methods of exposure assessment, analysis of chemical and microbiological pollution of water, air and soil, investigating epigenetic effects of environmental exposures in humans and animal models, and the use of animal, in vivo, and in vitro models of human diseases and disorders induced by developmental exposures to xenobiotics and environmental chemicals. Explore the tabs below for more information about our areas of expertise. Dr. Ford’s research interests include community based participatory research methods, epidemiology of waterborne disease, global environmental health, ecotoxicological models, molecular approaches to examine microbial diversity and pollutant cycling, transformation and bioaccumulation, influence of environmental stress on microbial diversity in natural environments, role of biofilms in survival and proliferation of pathogens in water distribution systems and in corrosion of metals and other materials. Dr. Ford is the Chair of the Department of Environmental Health Science. Dr. Pilsner’s laboratory investigates how environmental and nutritional factors influence health outcomes via epigenetic processes using both epidemiological and experimental approaches. More recently, Dr. Pilsner has focused on understanding how paternal exposure to endocrine disrupting compounds affects reproductive and offspring health – in both embryonic and placental tissue. Specifically, his work examines phthalate exposure across a diverse set of reproductive outcomes, including male reproductive health, birth outcomes, and offspring neurodevelopment. Dr. Aelion’s research focuses on biodegradation of organic contaminants, including gasoline, jet fuel and chlorinated solvents, in groundwater and vadose zone soils, development of novel tools for assessing remedial technologies, application and development of enhanced remediation systems for contaminated ground water, impact of land use, including golf course development, on coastal environments, pesticide removal and nutrient cycling, heavy metals in residential soils, primarily arsenic, lead and mercury, and their potential associations with negative health outcomes in children, including intellectual disabilities in susceptible populations. Dr. Aelion is the Dean of the School of Public Health and Health Science. Dr. Calabrese studies host factors affecting susceptibility to pollutants, and aims to understand the nature of dose and response in the low dose zone and underlying adaptive explanatory mechanisms. Much of this work focuses on discoveries in expanding understanding of the hormetic-biphasic dose response relationship. These observations are leading to refinement of scientific foundations for risk assessment and environmental regulation for radiation and chemicals. Dr. Peltier’s lab investigates the specific chemical components of ambient particulate matter that have a significant effect on human health. His main interests revolve around applying advanced aerosol characterization methods towards understanding the mechanistic effects of these pollutants on human health through a combination of novel designs and applications of instrumentation, controlled laboratory generation of aerosol, and field work in polluted locations. Much of Dr. Peltier’s work centers on global health related to air quality. Dr. Pollitt’s research is focused on profiling the exposure-response continuum to environmental air pollutants. Her work has investigated how the residual signature of internalised traffic pollutants can be informative of acute cellular and physiologic cardiopulmonary responses as well as the pathways that underpin these system perturbations. Mapping the totality of individuals’ environmental exposures over their lifetimes is proposed as a novel approach for chronic disease diagnosis and, most importantly, prevention. With the aim of understanding these environmental influences on disease, her research examines the dynamics of air pollutants following deposition in the internal chemical environment through the development of exposure biomarkers. Dr. Roger’s research focuses on human exposure to airborne biological material and resulting health effects in both indoor and outdoor environments. As an aerobiologist, she studies “the microbiology of the atmosphere” and is interested in all aspects of the aerobiological pathway including source, release, dispersal, transport, deposition and impact of bioaerosols. She investigates exposure to allergenic proteins and other components from pollen grains, fungal spores, pets, rodents, and insects. Her two main areas of intensive research focus are 1) the impact of global climate change on allergic disease from changes in the production and allergenicity of aeroallergens such as ragweed and grass pollen, and fungal spores e.g. Alternaria, and 2) measuring chitin in environmental samples and examining the role of chitin exposure and human chitinases in the development and exacerbation of asthma. Dr. Suvorov’s research focuses on understanding the molecular mechanisms that participate in life-long programming of mammalian tissues following developmental exposures to environmental xenobiotics. In particular, he is interested in long-term reprogramming of metabolic, reproductive and neuro-behavioral functions, the role of the mTOR pathway in this reprograming and epigenetic mechanisms underlying long- lasting maintenance of tissues’ malfunctioning. Dr. Suvorov uses a variety of approaches including animal and in vitro models and state of the art genomic and epigenetic methods which capitalize on recent advances in high throughput sequencing. 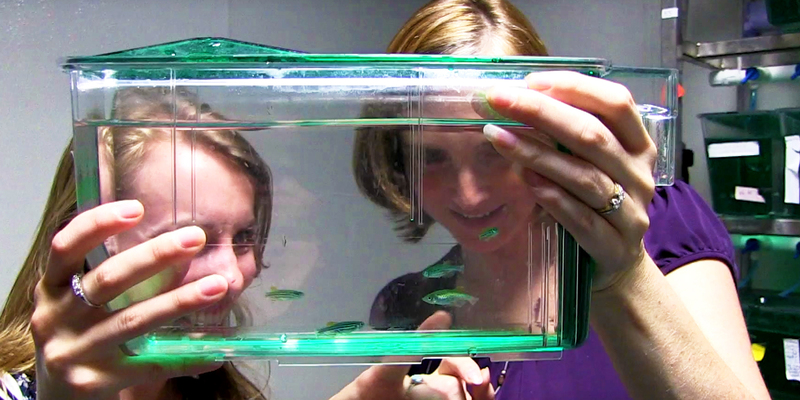 Using the zebrafish (Danio rerio) as a model system, Dr. Timme-Laragy’s research aims to elucidate cellular and molecular mechanisms of toxicant-induced oxidative stress in embryonic development, and identify later-life consequences of embryonic exposure to oxidative stress. Of particular interest is to understand how transcription factors, such as Ahr and Nrf2, play a role in the ontogeny and adaptive response of antioxidant defenses during embryonic development. Dr. Vandenberg’s research explores how early life exposures to chemicals and chemical mixtures can predispose individuals to diseases that manifest later in life. Her work addresses how low doses of chemicals during critical windows of development can alter gene expression, cell differentiation, and tissue organization in subtle ways that can lead to adult diseases such as cancer, obesity, and infertility. She is specifically interested in endocrine disruptors and has worked extensively with chemicals used as plasticizers and flame retardants. Her work also focuses on how traditional toxicology assays have failed to identify a number of ubiquitous endocrine disruptors, and how current risk assessment practices can be improved in the study and regulation of this class of chemicals.